Macdonald’s contemplative drawings recall what Greece has offered European culture in the past. They are perhaps an ironic reminder of how the brittle, impatient demands of a modern culture can quickly overwhelm and alter the present. 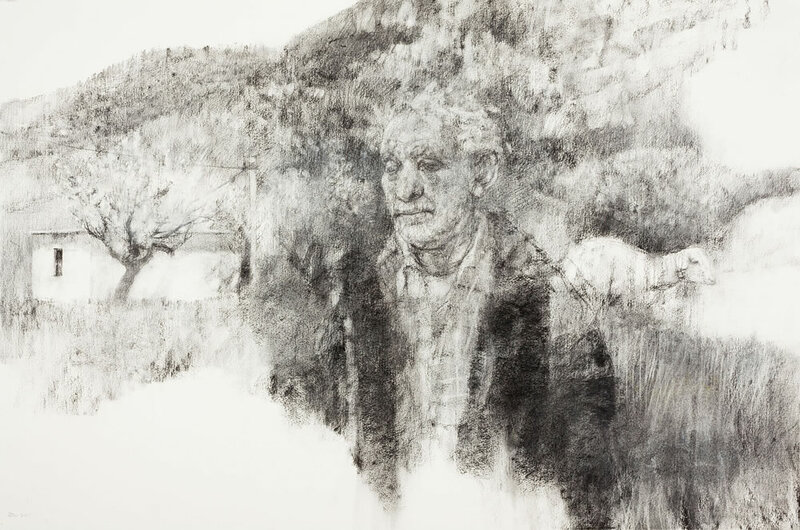 Through a series of charcoal drawings she evokes the space and light of remote Arcadian landscapes visited in the spring and autumn of 2011. There were wild storms in October, followed by a sharp frost. An old woman running a tiny roadside café in her front room gave us her own walnuts, raki and bread. On the television in the corner we could see rioting in Athens, smoke, cars overturned, politicians gesticulating, but there were few signs of strife in the countryside. Sometimes Macdonald finds a darker side of landscape, reflecting its status as a place in which human emotions and conflicts are played out. It is the tension between things observed and things remembered, between the immediacy of a specific visual stimulus and a process of retrospective distillation, that gives her work its power.